You may notice the many Pigeon Forge shops along the Parkway when you’re on your way to our hotel. The amount of candy that’s available here makes it irresistible to deny yourself the tastiness of these treats. When it comes to fudge, Pigeon Forge has many different homemade and fresh flavors for you to enjoy. We’ll give you 6 that you’ll want to at least sample while you’re here! There’s no denying the popular Rocky Road recipe in Pigeon Forge shops that sell fudge. Many people may think of it as an ice cream flavor first, but it’s also made as a delicious flavor in fudge form. With its contents featuring marshmallows, nuts and chocolate chips, it’s a perfect combination in every bite that you can find quite easily here in Pigeon Forge. Monkey Butter is not as familiar of a flavor to the masses, but of all the Pigeon Forge shops that sell fudge, ​Chocolate Monkey​ is the one place that has this delicious dream treat. Its recipe as a topping or ingredient in the form of bananas and pineapple is quite different from the taste here. Their interpretation is simply wonderful, and their guests have made it the most popular type of fudge. When it comes to creamy fudge with a bit of a punch, Butter Pecan is a Southern favorite found in many Pigeon Forge shops. The pecan is a popular nut found in many recipes for sweet treats — especially in pies. It’s no surprise you’ll find it as a flavor in almost all the candy shops in Pigeon Forge. You’ll never be able to resist this flavor after a sample! You’ll maintain your nuttiness for fudge after trying Maple Walnut in the Pigeon Forge shops. 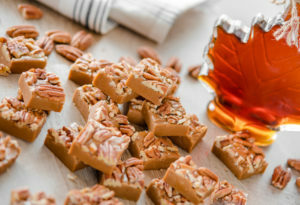 Maple isn’t just a syrup you put on pancakes, and walnuts aren’t just something you put in cookies. The Maple Walnut fudge you find here will remind you of the pancake breakfast you ate earlier. How sweet is that! Pigeon Forge shops that sell fudge aren’t all candy shops. ​Three Bears General Store​ is one of the exceptions, and you can find fantastic fudge here that includes the classic Almond Joy. It’s simply homemade goodness like no other, with its rich chocolate fudge with almond chunks and shredded coconut. Joy is the feeling you’ll have after one little bite! A childhood favorite of many, better known as ice cream but found in Pigeon Forge shops as fudge, is Orange Creamsicle. You can find it at various places, but we especially love it at ​Country Candy Kitchen​ in Pigeon Forge. If you loved orange sherbet push pops, you’ll discover a whole new love of it in fudge form! Pigeon Forge shops are loaded with shots of sugary goodness. This tourist destination has its fair share of fudge, and when you stay with us at Mountain Melodies Inn, you’ll be surrounded by a bunch of outstanding options. Reserve your room at our Pigeon Forge hotel today and satisfy your sweet tooth by living out your fudge fantasy!